I am glad you got Sherlock, I was too booked during release week to accept it..but so look forward to your thoughts. There is a new show coming December 7th called The Library. Be sure and look it up..I am super excited. I've been seeing the ads for The Library and am so excited! I really enjoyed the movies they did a few years ago. Plus I feel like TNT owes me for canceling Perception! I've put the Sherlock book on my tbr. It sounds really interesting. I'm hoping it's as good as it looks like it will be! I haven't tried Gaffigan either but I've heard good things about this one. We are hosting as well. I much prefer hosting to traveling this time of year! 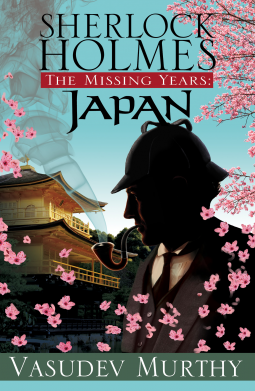 That Sherlock book looks really interesting and I love the idea of the setting in Japan. Definitely going to have a nose at that on NG :) All your Thanksgiving plans sound like fun, enjoy! And I'm giving the sound of that pie a big thumbs up! Thanks! It's pretty tasty! I'm looking forward to the Sherlock book. I'm hoping it lives up to its potential. Thanks! I've done Thanksgiving so many times it usually goes pretty smoothly! Sherlock looks really good, Katherine! I hope you'll enjoy it. I've had the french Canadian Version. I like the Sherlock story, but I don't like how socially inept he is played these days. I do like in the current tv shows how they have to remove all popular cultural references to him, the cases, AC Doyle, and Watson. So no one can say derisively, in a Cockney accent, "Well, you're just a regular Sherlock Holmes." I hadn't thought that we don't hear references to him anymore! In all honesty I prefer the Holmes in Elementary to the one in Sherlock. He can be a little too odd in that one. Have a great Thanksgiving week, Katherine. The Sherlock story draws me - will you review it? Enjoy having the kids around - they grow up and leave home before you know it. We're getting two home for Thanksgiving, so we are looking forward to it! I will definitely review it but I don't think it comes out until March so it will be awhile! I am defied untimely starting to realize how quickly we will be a single child house. It's just weird thinking about it! hmm, not too original here, but that Sherlock is also calling me! I think it's just universally interesting looking! How exciting that Major Crimes is coming back! Love that show, which filled in seamlessly when The Closer went off the air. I've really liked Major Crimes. I wasn't sure at the beginning but I've really ended up liking the main character. That DVR kills me! I think it and my NetGalley list are working together! I put myself on the waiting list at my library for Yes Please. I'm hoping to get the audio of that one. Like you, I have way too much on my DVR. I watch Forever and I'm enjoying it. Oh good to know about Forever! I'll definitely check it out! I'm liking the Amy Poehler book so far. Hope you do too! Thanks! I always love Thanksgiving! It is crazy how quickly summer flew by. It's hard to believe it's almost December! I was hoping to be organised for Christmas by now but it hasn't happened for me either. Hope you have a wonderful Thanksgiving and you enjoy your new books. I'm not admitting defeat yet but I'm not nearly as on top of things as I wanted to be! Any week where NetGalley feedback is more than new NetGalley grabs is a win in my book! Can't wait to hear what you think if Yes Please by Amy Poehler - I've been eyeing that one too. I have the same problem with the holidays - I mean how is it Thanksgiving already? And Christmas - I'm so not ready, though I am excited to decorate! So far I'm loving Yes Please! I really enjoyed Tina Fey's and Mindy Kaling's as well. Aack!!! So not ready for Christmas! The Sherlock book sounds really good so I'm going to check it out on Netgalley. We also love the NCIS franchise but I stopped watching CSI. It watched for a little bit after Grissom left but then it didn't feel the same without him. My girls have so many Build A Bears that I hate to give them up (we spent so much money on them and the outfits!!). It is a fun store but it can be crazy! I hope you have a nice Thanksgiving!! Build a Bear is a serious money pit! It is fun though. I wasn't sold on CSI after Grissom left but I have really enjoyed the changes they've made in the last few years. LOL I'll let you know about the pie! So far I'm liking the Hoag but but I do feel like they may be better reading than listening. I will definitely be looking for more of hers. The Big Four by Agatha Christie is a book that keeps catching my eye as I've never read any Christie before, so look forward to reading your thoughts on that one. The Big Four isn't one of my favorites but I still enjoy it. It's one of her spy books which so e people love but others don't care for. Agatha is definitely worth reading! That is a win! I love turning in more reviews on Netgalley than books I have waiting. It's like the sweetest feeling. Build a Bear party? That sounds like heaven for kids! Lol. I love BossyPants! I want to get the audio version because is love to hear Tina read it. So far I'm enjoying Yes Please. Hope you get it soon. That Sherlock Holmes covers looks interesting, I noticed it when I was on netgalley this week. I hope you have a great thanksgiving, it's always nice when you can make the holidays less stressful as stress removes some of the fun from those days. That brown suger pie sounds good, let us know if you tried it and how it turned out! We don't celebrate thanksgiving here in the Netherlands, so it's just a normal week for me. Christmas sure seems close suddenly, I am happy I got most of the christmas shopping down, we won't be doing much this christmas just paying my boyfriend's parents a visit and having dinner there. My mom and husband plan a lunch in a different day as chirstmas as that worked better, which is fine with me! I'm excited about the brown sugar pie! I have high hopes for it. The great thing about Thanksgiving is we get a little bit of a break before all the Christmas madness ! I love the idea of steak! I think my family would boycott but that sounds amazing! Hope your in-laws take it okay. I'm really excited about the Sherlock book. I hope it lives up to them! The Sherlock book looks interesting; can't wait to see your thoughts! And also on the Living Well, Spending Less book. I could use some tips on that myself! Enjoy having family together for Thanksgiving! We don't get 'Robin' home for TG anymore, now that she's in college 3/4 of a continent away. She goes to my parents' house instead, along with her roommate who can't get home either. On the plus side, though, she gets a month off from mid-Dec. to mid-Jan., so we get to see lots of her then! I figure it's only a matter of time before we don't have all of ours for holidays. How great that she's able to visit with your parents and that you get her home for such a good visit later in the year. I'm excited about the Sherlock book and the Living Well book. I haven't read much of it but I really like the author's voice so far. Forever is nice, I like it. Not terribly but some good actors and the stories are decent enough. I'm looking forward to The Librarian on TNT but I have my doubts about Kane in the role. Still, it's worth a watch once it's available on NetFlix (no cable). Have a great time with your family and happy Thanksgiving! I'm so excited about The Librarians! I loved the movies that were made several years ago. I'll have to try Forever. I'm curious about it. These are all new to me! The Sherlock book looks awesome! For Thanksgiving we go to my in laws and it's a pretty simple and easy affair. It's nice to chat with other grown ups for once and I think that's what I'm looking forward the most, lol. I'm excited about the Sherlock book! It's always lovely to talk to adults! I look forward to the part too!